At Smart Drive UK we can make your dream of being your own boss a reality as a Qualified Driving Instructor by providing you with a First Class Instructor Training course and a Guaranteed position with us on completion. Just because you want the best driving instructor training course you do not need to pay the earth as others may charge which is why our driving instructor training programme with Pathfinder ADI Training & Development starts from as little as £600. • You will receive training on a 1:1 basis, tailored to your specific needs and in a way that you learn best. • You will have the option to select our unique online learning system to guide and support you through the learning process. • You can train around your current commitments and at your own pace. • Learn how to train all standards of driver using the most effective methods. • Receive all the necessary reading materials, resources, webinars etc. to help you achieve your goals. • Have your progress tracked and monitored. So if you feel that having a career as a Driving Instructor is for you and you can say YES to the following questions then do not hesitate to contact us immediately by completing the contact form and we will call you for a chat. Have you held a UK driving licence for at least 3 years? Can you see a licence plate at 90 feet (27.5 meters) with or without glasses or contact lenses? You have no more than 6 points on your licence? Are you happy for the Governent to complete a Criminal Records Bureau (CRB) check? 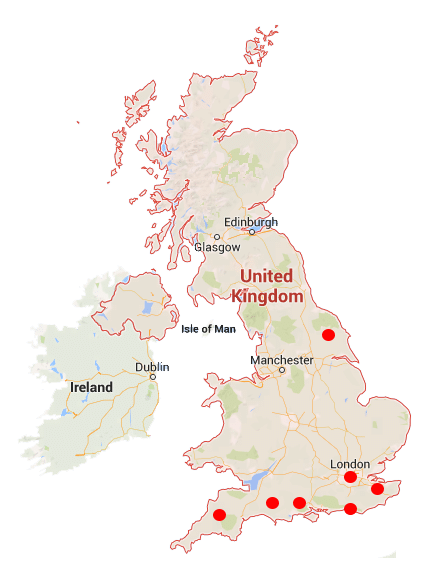 Here you will find an up to date list of each county and each town or city within a county that we provide a driver instructor training service within. Click on the town names to go to the area specific page where you will find prices and booking information.